Don&apos;t! 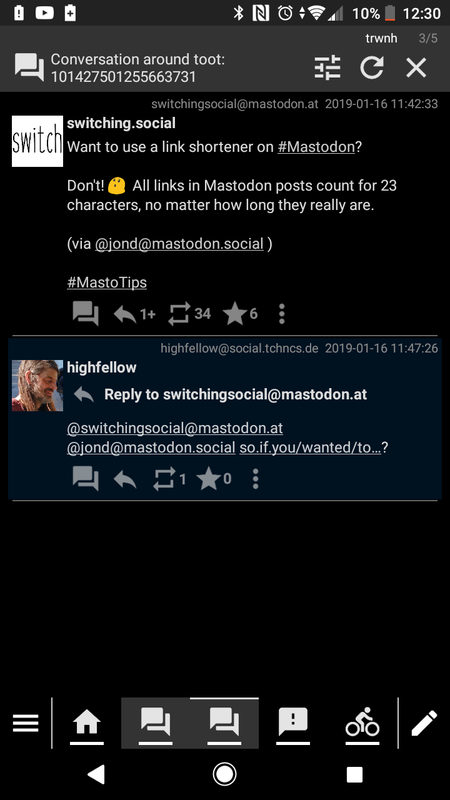 All links in Mastodon posts count for 23 characters, no matter how long they really are. @trwnh @switchingsocial @jond true, but you can see it when you hover the mouse! @InspectorCaracal @highfellow @switchingsocial @jond max length is a tricky beast. Thr web standards do not define it, so it is left to implementors. 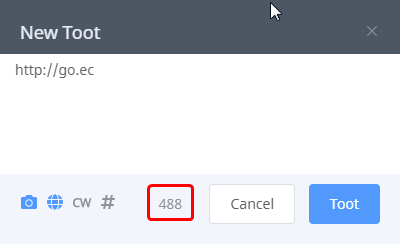 Some browsers take up to around 4000 characters, some even more, but for wide-spread support, you should stay within two-toots-worth (around 1000 characters). Now, how would mastodon deal with them? Dunno, it might be worth a look into which url parsing library they use and find out. Oh que c'est une donnée que j'ignorais ça!!! @joel_olbrich @switchingsocial @sydneyfalk @jond is this like hooktube? @r000t @switchingsocial @jond 23 is the length of Twitter-shortened urls. @r000t @switchingsocial @jond No real technical reason, I imagine. Some default number had to be chosen and there was already a "standard" so might as well follow it. @switchingsocial @jond oh, good to know. True,but this also depends on your client supporting it. #mastalab does not seem to know about this and does not allow you to toot in these classes. In fact, it's false. Mastalab doesn't limit chars. So even if it counts all chars for a link, the real value will be used. Also, you have an option to automatically split your toots. Not my experience, but I'll check again.